Liver disease can take your buddy from you. If your kitty starts drooling, losing weight or holding his head funny, one of the first things to suspect is liver failure. You may see some other signs of trouble, too. Speed is everything when dealing with liver problems, so whisk him off to the vet immediately for a checkup. A cat with liver failure may lose his appetite and stop eating. This might go on for several weeks or only a few days, but it will cause him to drop a lot of weight quite quickly. Since anorexia can actually bring on liver failure, take your cat to the vet if he skips meals for even one or two days. Other symptoms that can accelerate his weight loss are vomiting and diarrhea. The diarrhea may or may not be bloody, but either way it can be serious. You can’t always tell what’s going on inside your kitty, but liver failure does create some fairly unique and obvious symptoms. One of the most visible of these is drooling. While some cats actually drool a bit when they are happy and relaxed, drooling due to liver failure isn’t going to come and go according to your pet’s mood. If his liver is struggling, you may spot signs of jaundice, which most often appears as a yellowing in the whites of his eyes. He may also bend his head and neck forward and down for no apparent reason. Any number of things, including cancer and diabetes, can cause liver failure, but often there’s no way to know what triggered it. Some things to watch for that could end up causing liver failure are a cat who is very overweight or a cat who stops eating for any reason. Even a kitty who gets lost for a couple of days is at risk for developing liver problems, since it’s likely that he’s missed a few meals. 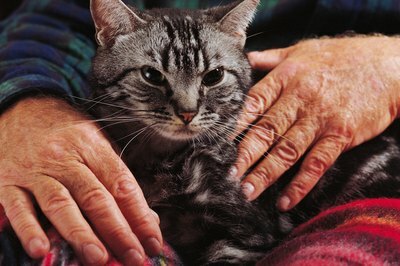 Any illnesses that cause him to stop eating for any length of time can also trigger liver failure in a cat. If you suspect that your kitty has a serious problem, even if you aren’t sure if it’s liver failure, rush him to the vet. He’ll need plenty of support to carry him through the crisis. Your vet may use intravenous fluids and tube feeding to make sure your cat doesn’t starve or dehydrate while he’s struggling with liver failure. The doctor will also prescribe medication for your cat, including antibiotics if they’re required and medication to support and improve liver function. If treated in time, many cats begin to improve within a week and can ultimately recover from liver failure. Can Hypoglycemia in Chihuahuas Cause Liver Failure?